A good luck charm is easy to make and a great feng shui tool whether you need a little luck or a lot. Feng shui provides a number of good luck charms and symbols to encourage positive chi and protect against misfortune. Feng shui charms can be made from antique coins and calabash gourds. This type of charm is easy to assemble; you can even buy all the pieces pre-made if you're time-challenged or all-thumbs. The calabash gourd is a feng shui remedy for negative chi in the environment but its real power is in conferring robust good health, longevity, an abundance of blessings and prosperity. Add the Wu Lu, the lucky calabash, to the sides of your bed or the health corner of your bedroom. Hang it in the East of your home or your living room to stimulate health. A Wu Lu charm dangling from the rearview mirror of your car will guard against accidents or misfortune. Calabash, with its double globe shape, symbolizes heaven and earth. Heaven is the top, smaller globe so always hang or place the calabash with the small globe on top. 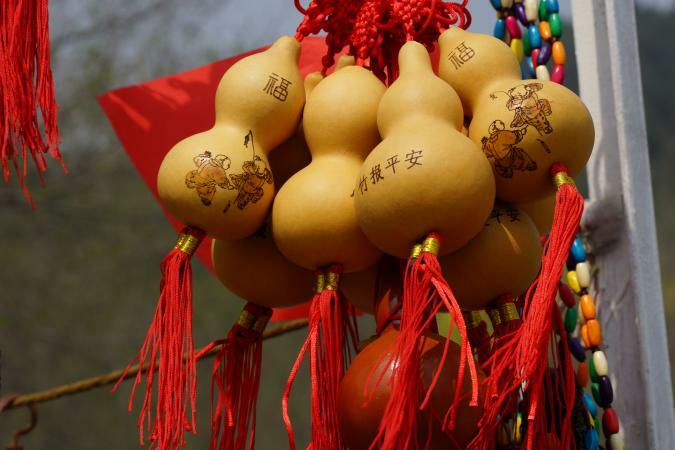 Decorate your calabash charm with Chinese characters written in permanent marker, a design painted or glued on, or cover the gourd in gold paint to boost its prosperity magnetism. Wipe off the calabash to remove any dust or dirt and paint the exterior gold. Allow the paint to dry and check for any streaks to touch up. If the gold isn't opaque enough, give the gourd another coat. Cut four 24-inch lengths of cord. Tie two lengths together with a square knot, catching the loop of the tassel in the knot. Tie the remaining two lengths perpendicular to the first lengths, using another square knot and catching the tassel loop and knotted lengths in the knot. Nestle the painted gourd into the "cradle" of knotted cords so the large globe end is on the bottom. Arrange the cords evenly around the gourd, draw them to the top and secure with a rubber band. Brush clear glue around the narrow "waist" or "neck" of the gourd. Continue wrapping the cord around the gourd for about six turns. Tie off the cord with a tight square knot and trim the loose ends. Paint one more wash of glue over the wrapped cords and let the glue dry. 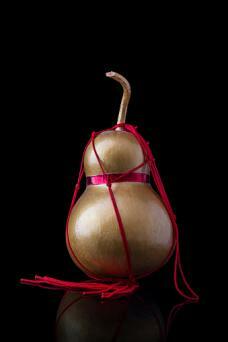 Tie the vertical cords around the gourd stem at the top, to hold them in place along the sides of the gourd. If the gourd has no stem, gather the four cords together and tie them in a single simple knot, snug against the top of the gourd. Select two free ends of cord to knot into a loop for hanging the lucky calabash gourd charm. Trim the excess and the other two lengths close to the gourd. (Optional) Add decorative beads to the tied ends of the glued wrapping at the narrow point of the calabash and to the hanging loop at the top for extra embellishment. Feng shui good luck often involves notions of prosperity, abundance, wealth, and money. Old Chinese coins -- the kind with the center holes and inscribed calligraphy around the rim -- make a powerful lucky charm for attracting wealth. Use three, for heaven, earth, and humans, or nine for an increase in wealth. Knot them together in a string to hang in your wealth corner, or over the wealth corner of your desk in a home office. Use red thread to activate the prosperity potential in the coins. Cut a yard of 0.5mm nylon cord (standard weight) for a 3-coin charm. Find the loop end of the tassel. Secure the tassel and the folded length of cord together by overlapping the tassel loop and the fold at the midpoint of the cord, keeping the tassel loop on top. Bring the free (cut) ends of the red cord up and over the tassel loop. Poke the ends down through the tassel loop and the midpoint loop of the red cord where the two overlap. Pull the free ends of the cut cord all the way through to "lock" both tassel loop and the cut cord together. Slip a decorative bead over the two free ends and slide it to the tassel. Tie a square knot in the cut red cord (right over left, left over right), snugging the bead in place. Now your tassel is attached to the red cord and topped by a bead. 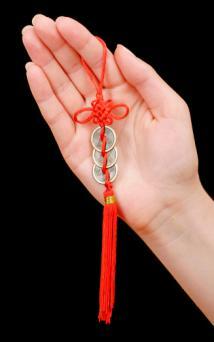 Place a Chinese coin on top of one strand of the red cord and lay the other strand over the coin. Pull the free ends of the red cord through the coin -- one over and through, one under and through. Place the edge of the next coin over the first one with one strand of the red cord under and one over. Repeat the threading of the cord strands through the hole of the second coin, keeping the coins snug and flat but not bunched. Repeat once more with the third coin -- and any other coins you want to add to your string. At the top of the coin string, take both strands of cord and form a simple knot, treating the two strands as a single cord. Tighten the knot. Now make your miniature Chinese butterfly knot with the rest of the cord, to embellish the top of your lucky money charm when you hang it up. The mini-butterfly is a slightly simpler hybrid, a double-loop fusion (with fewer center knots) of the elaborate butterfly and the classic Good Luck or Propitious knot. You'll often see a Propitious knot with side "wings" on smaller store-bought Chinese charms. This version is easier for a first-time knotter. Tie an overhand (basic) knot and draw the strands together to tighten. Leave a length of about 1.5 inches from the last knot of the coin string to this first knot of the fancy topper. Pinch the two free strands between the two knots together with your left hand and bring the right strand over the pinch point, leaving a small loop before it crosses the pinched cord. Bring the left strand under the pinch point in a mirror image of the right strand. Hold the pinch point so it won't fly apart and bring the raw end of the cord on the right up through the small loop you left. Bring the left raw end down through the left small loop. Gently tighten the knot but keep it very relaxed; you won't pull it snug until the completion of the knot. Now your knot-shape is slightly triangular. Poke the right end of the cord up through the center of the knot -- this is the overlap at the top -- you may need to loosen it a bit to poke the end through. Poke the left end of the cord behind the loose knot, up through the center, so both free ends are poking up, parallel, from the top of the knot. Hook your pinky fingers into the lower loop of the cords (closest to the coin string) and grab each separate free end with a thumb and index finger. Pull evenly, top and bottom, to relax and open the knotted section . Switch the free ends over each other, right over left, keeping the center of the knotted section open. Bring the right end around under and up through the opening in the knot. Do the same with the left end. Flip the whole knot over -- the free ends are now on the bottom and the end attached to the coins in now on top. Start to tighten the knot to make the butterfly. You'll see two outer loops. These become the "wings." Pull the right outer loop and the opposite top strand simultaneously to slowly tighten the knot. Alternate pulling the right and left sides, gradually tightening the middle of the knot and creating two small wing loops on either side. The middle of the knot will look like a triangle. Work that knot fairly tight to secure the butterfly shape. Hold the coin charm string by the free ends so the tassel is hanging below and the butterfly knot is at the top. Knot the free ends together to make a final loop for hanging your charm. Trim any dangling loose ends once you have sized your finished charm. Don't limit your lucky dreams to your living/working spaces. Carry magic charms with you in miniature versions set into bracelets, earrings, necklaces, key chains, and backpack charms. Tuck a silk drawstring bag filled with tiny lucky charms into your luggage and feng shui your hotel room. Hook a dried calabash on the strut of your beach umbrella. Tie a trio of lucky coins to the handlebar of your bike. Lucky charms make great housewarming, new baby and holiday gifts -- add one to the bow on a wrapping to give the gift of good fortune to a friend.